We’re here to help. These are the required and optional items needed for a Davis Program application. 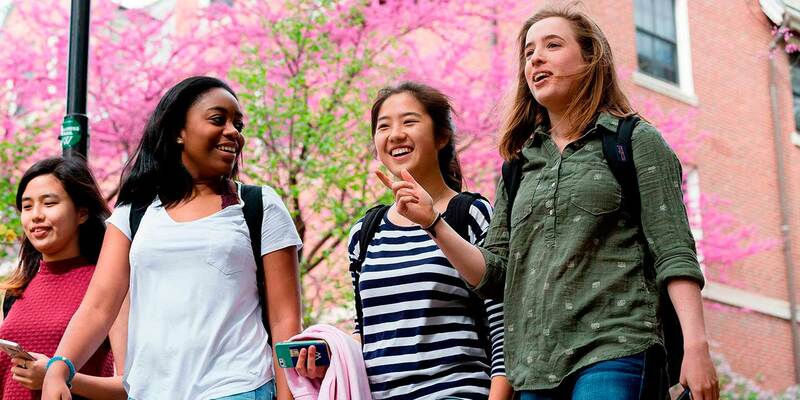 While every Davis Scholar has a unique story, what they all share is an eagerness to engage in Wellesley’s vibrant academic community. Students who are successful in the Davis applicant pool typically have completed some recent coursework at a community college. Prior to graduation from Wellesley, the College requires that all students satisfy distribution requirements, including work in English and writing, mathematics, the sciences, social science, and foreign language. When reading an application, the Board of Admission must feel confident the application contains evidence that a potential Davis Scholar can be successful in these fields. Once you create a login with the Common Application or Coalition Application, indicate that you are a Transfer Student. For the Coalition Application, click on “Build your list” on the Overview page. Search for Wellesley College and click “Start application” and under “I am applying as” select Transfer Student. You’ll need to write a personal essay and a short, Wellesley-specific essay, and respond to a short answer question. See our application tips for advice on writing your essays. For your personal essay, you may choose from the prompts below or write on a topic of your choice. The essay should be between 250 and 650 words. Please provide a statement that addresses your reasons for transferring and the objectives you hope to achieve in doing so. Provide a brief description of your educational path since leaving high school including any reasons for interruption. We require your official transcripts, a college instructor’s evaluation, and a college report completed by your academic advisor or dean. These can be submitted online through the Common Application or Coalition Application. Once you have selected the school at which you were most recently enrolled school, you can list and save the names of your evaluators in the “School Forms” section. Instructions will be emailed to them with information on how to submit the forms online or offline in print. If you did not complete high school, please submit your official G.E.D. scores plus an official high school transcript for the years you were enrolled. Submit official transcripts from all colleges and universities you have attended. The form for requesting this information should be sent to the registrar of the colleges you attended. Check with the school for procedures and fee information before requesting a transcript. Transcripts must be sent directly from the college. Student or online copies will not be accepted. Please arrange for the college(s) to send official copies directly to Wellesley's Board of Admission. Please provide a college report completed by your academic advisor or dean. This report tells us if you are in good standing at your current or most recent institution. The College Report form can be found in the Common Application or Coalition Application. Two evaluations/recommendations are required. Please send a Common Application or Coalition Application evaluation form to each person you intend on using to use as a reference. Recent academic evaluations are more useful to the Board of Admission. If you have been out of school for several years and are therefore unable to obtain academic evaluations, you may submit one from an employer or a supervisor in community activities where you have worked. Evaluations/recommendations from friends and relatives are discouraged. The mid-term report must be completed by any applicant who is currently enrolled in college courses. Please list the courses that you are taking in the current semester on this form and return it to our office immediately following the midpoint of the semester (March 20). The form gives us a sense of how you’re doing in your current coursework, so ideally it would be filled out closer to midterms. If you turn in a form with no grades, it will not be considered in your file. Please submit an updated resume via the Common Application or Coalition Application. All Davis Degree Program applicants are required to sit for an interview. The deadline to request an interview is March 1. Please contact us early to schedule an interview, because spots fill up quickly. Davis Program applicants are not required to send us their scores, although you’re welcome to submit them if you’d like. Results must be released to Wellesley College from the testing agency. The College Board school code for Wellesley is 3957. The ACT school code for Wellesley is 1926. You must submit your portfolios, recordings, or presentations electronically using SlideRoom. Wellesley does not accept the Common Application’s arts supplement form. Please do not mail any materials to the Office of Admission. Submissions sent by mail will not be reviewed or returned.